We’d just arrived, our clutch of children tumbling out of the car to stretch and explore, when I spotted two campers walking down the dirt road, staring intently at me. I stopped, anticipating a request to move the trailer or donate to the communal porta potties, but they just stared. Not at me, I realized, but past me, into the air above me. I followed them with my eyes down the dirt road until they stopped and in unison raised binoculars. I squinted. Black? No. Brown with some white? Maybe. 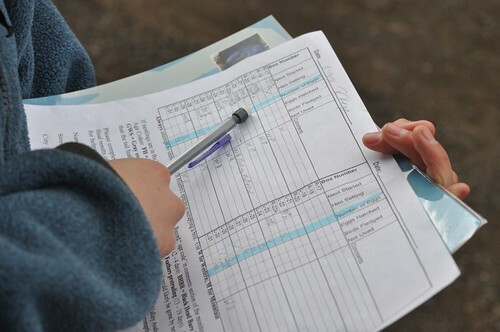 Later that evening around the campfire, that indescribable, unrecognizable bird was named and counted as part of the annual sighting and cataloging of more than 200 different birds in Washington’s Wenas Wildlife Area. No one’s seen a ___________ yet? What about a ____________? It’s been spotted here, but not for some time now. What about a __________? 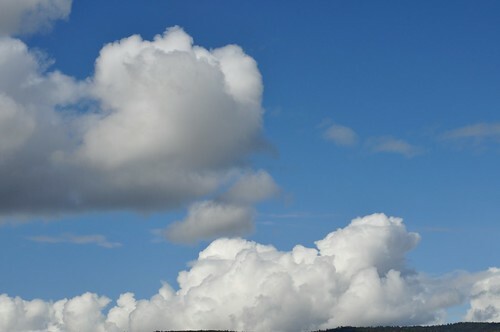 Anyone else see one of those today? You can catch them just as the sun sets above the rabbit brush, just a flash of them as they dip into their nests. I returned to our campsite and a reference book to look up these birds. I found the thrush, the tanager, the bluebird, but no mention of the greater pygmy chicken lark or did they call it a hawk? Maybe it was prairie and not pygmy? I decide I’m ill suited for birding, that this must have been a collective joke and I just wasn’t in on it. Bird identification might be beyond me, but a birder is easy to spot. Both male and female must be about 60 years old, wear wide-brimmed nylon hats and matching pants that zip off at the knee. Binoculars hang from the neck and a camera is slung over the shoulder. Some carry tripods and folding chairs. They prefer to silently sit and wait for a bird to fly overhead, or to silently walk through a grove of trees, heads titled skyward. A camp full of birders can be confused with a camp full of librarians: Everyone is quiet, appreciative, respectful. Therefore, it’s odd for the birders to camp adjacent to the four-wheelers. But somehow, these two camps and their divergent views — to coexist or conquer nature — co-habitat for one long weekend out of the year. 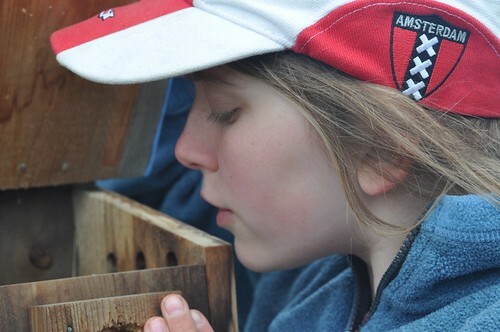 We had joined them at the invitation of neighbors, who asked us to monitor bluebird nest boxes. We had left Seattle, climbed over the Cascade mountain range and dropped into dry, sunny country with views that stretched to the sky. As we drove, I smiled at the clouds and welcomed the sight of the bristly ponderosa pine, which reminded me of Nevada, my home up until a year ago. The bluebird is Nevada’s state bird, but I’d sighted only one in the decades I’d lived there: while walking in the foothills a brilliant blue darted across my path, leaving me breathless and happy. 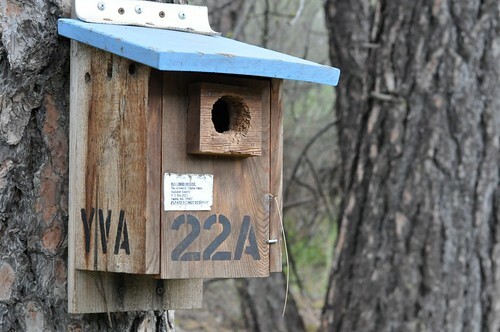 Now we turned off the highway and onto a stretch of rutted road where birds dipped and soared in front of the car and twice I saw a bit of blue as we passed dozens of nest boxes, mile after mile of small wooden homes. 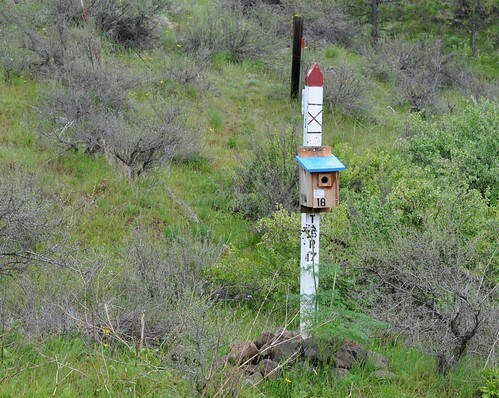 More than 12,000 bluebirds have hatched along this dirt road since people hammered the first box onto a post in the 1980s and began to count eggs. Each spring, the same courtship occurs: The male’s call is a short, subdued cheer, chur-lee, churr. A hen arrives. He shows her around his territory, waves his wings and feeds her tasty tidbits until she chooses a site. She builds a nest from ribbons of fine grass and lays the eggs while he bears his rusty breast and stands guard. Together, they raise the fledglings. I think about last spring when Marcel moved first and found a neighborhood. How I flew up and chose our home. I think about my recent irritation with renting, my preoccupation with Zillow and the random open houses I have visited. 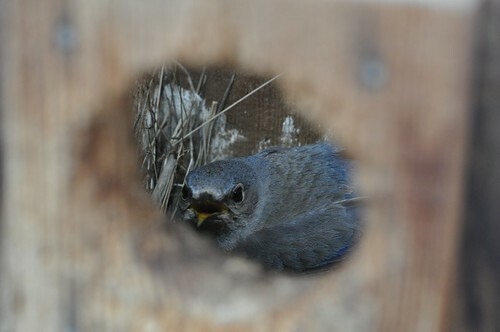 I am not much different than the bluebird. 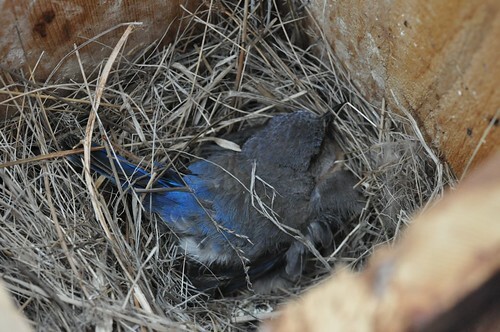 Before entering a bluebird nest box, knock lightly in order to alert the hen to your arrival. Listen for the the sound of a squatter’s rattles for sometimes a snake will slither through the opening, swallow fledgling or egg and decide to stay. Do not bother the new tenant. However, if your knock is met with silence, open the lid and peek inside. If you find the hen at home she might hunker down, fluff her sooty wing feathers and fan her tail, which is an iridescent cobalt blue. 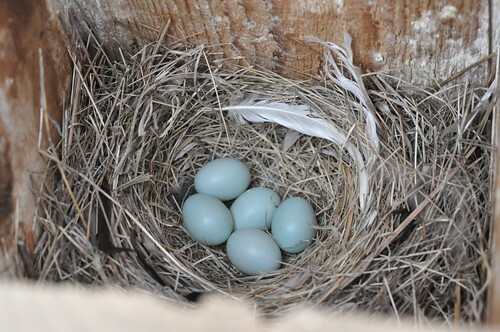 If she is gone hunting for insects, count the number of small oval eggs and note their similarity to the color of dusk, when blue drains from the sky. It was late when we pulled into camp and set about constructing our home for the night, for what is a home but a multitude of endless acts: organizing, cleaning, scrubbing, polishing, patching, mending. In fading light and creeping chill, we opened the trailer. I laid sleeping bags in rows, fluffed pillows, then stepped back to observe my work, my nest. Outside, a fire had been built and I began dinner as shadows lengthened and darkened. In the deepest recesses, night already had arrived. I looked for the first star, a flash of tin in the graying sky. I looked at the silhouette of a tree and imagined my bed there in its limbs; the moon an egg held in its nest of thin branches. That night I slept without dreaming. It was cold when I woke, shivered into my jacket and wool hat and stepped outside into air like a film of water over a still pond, it reflected sunlight and feather and a song I’m certain the birders could identify. Marcel handed me a mug of coffee and looked past me, above me. I turn but there was no bird. My hat? I asked. Your hat, he replied. 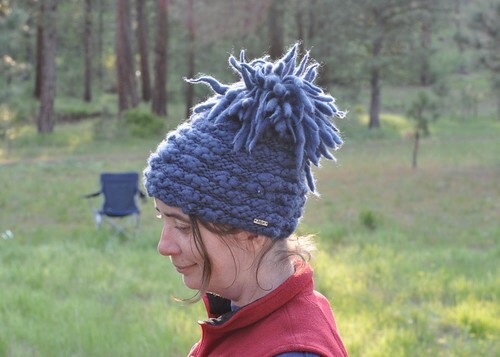 I shrugged and answered that it made me happy, this shade of blue, this fluff on the top of my head, and decided it looked like a bluebird’s plumage. I wear it the entire weekend. “Tinkers” by Paul Harding was the inspiration for some of these observations. A worthwhile adventure. I think I’m due for one of my own. I really enjoyed Tinkers. Thank you for the link to the review by Todd Davis. The Horizontal World: Growing Up Wild in the Middle of Nowhere looks very good. I like your hat. Because we’ve let our fields to indigenous grass, they are suddenly home to all kinds of interesting birds… and the birders that come with them: I know the type you describe. Sounds like a lovely adventure… and the perfect wardrobe accessories to complement it. “She builds a nest from ribbons of fine grass…”. What a charming visual. Thanks for sharing your adventure. What an adventure filled with such joys. I’m super jealous. I hope to be one of those birders you described when I am 60. It seems like the very best of hobbies. But I fear my mind isn’t set up to remember all those bird calls and species and colours and behaviours.